In this month’s vet comment, we speak to Gemma Thorpe of Myerscough Vets about lamb hypothermia and how to manage the disease in risk periods. It is estimated 80% of lamb losses occur during the first 10 days of life, and hypothermia is one of the major causes of these losses. Vet Gemma Thorpe of Myerscough Vets, explains no lamb is immune to hypothermia, but certain groups have an increased risk. Miss Thorpe adds there are two major risk periods; from birth to five hours old and from five hours old to three days old. “From birth to five hours old, the main problem is excessive body heat loss. Wet newborn lambs lose heat rapidly, like stepping from a warm bath into a cold room. Miss Thorpe explains there is a difference between the two risk periods because of the layer of brown fat surrounding the kidney which lambs are born with. When it comes to preventing hypothermia, Miss Thorpe says colostrum intake is key. Ewes in poor body condition will tend to produce poor quality, low volume colostrum. Their lambs will be higher risk and need supplementing with a good quality colostrum replacer or frozen colostrum. Miss Thorpe says ewes’ teats should be drawn to ensure they are working and not blocked by thick ‘plugs’ of colostrum. She says: “If lambs are having difficulty sucking, the colostrum should be given by stomach tube. Miss Thorpe says prompt treatment is essential and lambs must be brought in for treatment. “If the ewe has more than one lamb, remove all lambs for the treatment time to prevent rejection of the poorly lamb when it is returned. “The first step is to take the lambs’ temperature. A reliable thermometer is an essential part of your lambing kit. Normal temperature is 39degC. “Lambs which are older than five hours old and cannot swallow require glucose urgently. The fastest way to deliver this is via intraperitoneal injection. This is a simple technique which can easily save a lamb – ask your vet for a demonstration. 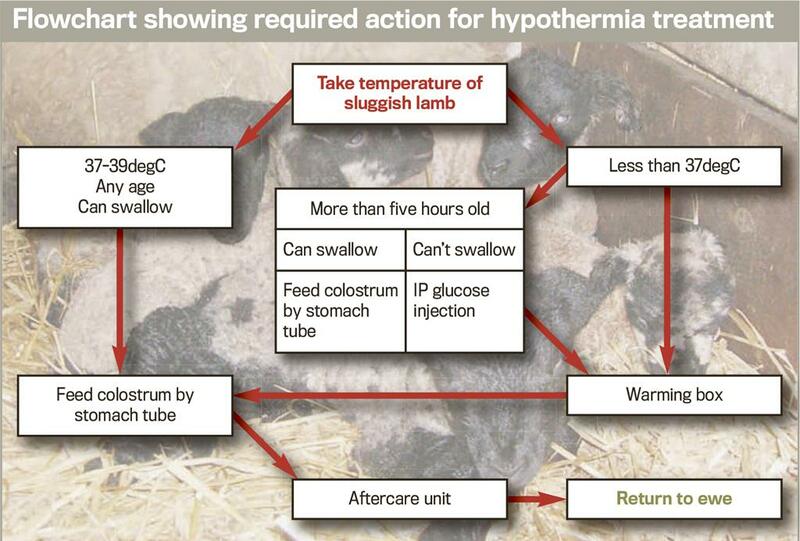 “Following injection, lambs should be placed in a warming box. These can be purchased or simply made from an old blanket box or chest. Lambs should be kept in the box until their temperature returns to normal and then given a feed before returning to the ewe.